Mont Blanc, One of the most popular mountains in the Alps, both for the apparent ease of the route, and the attraction of it being the highest mountain in Europe. This mountain is attempted by thousands of people a year. The mountain is packed with mountain guides and the huts crammed to the brim with expectant people hoping to summit. I decided to attempt it as soon as we arrived in Chamonix. As I sat in the guides office, with Pete and Jack planning their own route up the North face of the Drew, I was scanning the many folders filled with alp summits and routes, and suddenly decided that with the two day weather window given to us that I would attempt Mont Blanc. I asked every conceivable question known to man both directed at pete and at the guides. The weather looked good, the route looked relativity busy, which is what I wanted, with little knowledge or build up to the attempt I liked the safety net of guides that were going to be up the mountain. If all went to pot, I could simply follow the crowd. 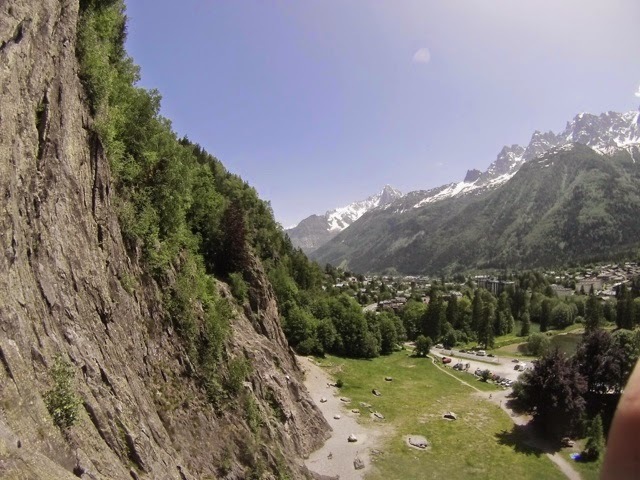 Shortly after visiting the guides office, I met up with a lad named Will Hornby who had been in Chamonix for about two weeks, but had fell ill, allowing for nothing but relaxing at the valley floor. Seeing as a solo attempt was probably a foolish idea, I asked if he would like to join me, and he was keen to use the two day weather window as much as I was. Planning to attempt The Gouter Route (Ordinary Route) up Mont Blanc, we set off from car park opposite the train station and hopped on the bus to Les Houches and immediately realised we were heading the opposite direction to Mont Blanc, getting off and running for the right bus we finally made it to the Bellevue cable car and started our ascent to the foot of the mountain, we then switched to the Nid' aigle tramway where we met some Scottish climbers who were also making the use of the weather window and making their own first attempt. Getting off the train, we quickly made our way up the Desert de Pierre Ronde, up to the Refuge Tete Rousse, where we had planned to push up the Grand Couliour, in the same day allowing for a short push to the summit the next day (990m). But this was not to be, we were not allowed up the ridge without previous booking at the Gouter Hut. We tried many times to contact the hut, but phone coverage was hard to come by, and resorted to having to stay at the Rousse for the night, this meant a couple of negatives and positives, staying lower down would mean a better nights sleep but would also mean an earlier start the next morning, it would also mean a safer traverse of the Grand Coulior, with no sun melting the snow further up, rock fall was less of an issue on the ascent, the final issue was having a very long day. With a 1:30am start we would have to ascend to the summit in 7 hours or less to allow for plenty of time to get down for the final train and cable car off the mountain. We spent the first evening playing scrabble with the Scottish men we met, making up words and playing a 'climbers' version, with words like cam, tat and the such allowed on the board. We were low on cash and could just about scrape a bed and breakfast, but dinner was well past our price range and had to use the 'self cooking' room, and cooked pasta and sauce, then proceeded to spend 2 hours melting snow for the next day (4 Euros to fill up a litre!). By 7 oclock we were packed and ready for the next day, and in bed awaiting the 1:30am wake up and breakfast. I slept like a log, and by some fluke woke half an hour early and set about sorting my kit, before the hut was packed with the clinking of crampons and rustle of gore tex. By 2:00 we were out of the hut, wrapped in just enough layers to keep us warm if we kept going, and with the Grand Coulior towering over us, there was no problem with that. Will and I had, by now built up a fantastic rapport and began moving roped up fantastically, with concept of exposure being suffocated by the small pool of light that was emitted from my head torch we moved at a good pace, with mixed rock and snow making its way up to the Gouter Hut. This was probably the busiest section of the route, with a lot of climbers bunched up directly after leaving the hut, there were a few bottle necks, but after 2 hours the route spread out and became quieter, reaching the hut. Getting to Aiguille de Gouter took roughly 4 hours and seemed to last for ever. the hut never seemed to come any closer, yet at last we stood above the Colouir with just over 3 hours of a slow slog to the top of the mountain. Ever since the 3,000m mark we had began to seriously feel the altitude and we had been stopping, in states of breathlessness and nausea. As Dawn broke over the Alps and the head torches slowly began to disappear, we were nearing the emergency refuge, the wind was picking up and we stopped for some much needed Haribo and a toilet stop. I was now feeling properly cold, and my feet were completely numb, I had attempted to wrap my feet with too many socks in my B1's and the circulation was slightly trapped backtracking the actual effect of the many layers. (Proper B2-B3s needed!!) Sitting next to the refuge waiting for will to go to the toilet, I watched the orange glow of the early morning sun glint off the Midi, and tried to let the rays warm me up. Now approaching the Grande Bosse in the shade, the wind picked up considerably and we stopped to add layers, Now with nearly every layer on and my RAB neutrino zipped up and my frozen buff hanging uselessly at my neck, Mont Blanc suddenly felt like well like, Mont Blanc. With 4,000m now well and truly under our belt, the slog up to the Peteite Boss felt nigh on impossible. The wind was so strong that we had resorted to using the axes as a communication device. We were managing at best, 10 paces and a rest on our axes. 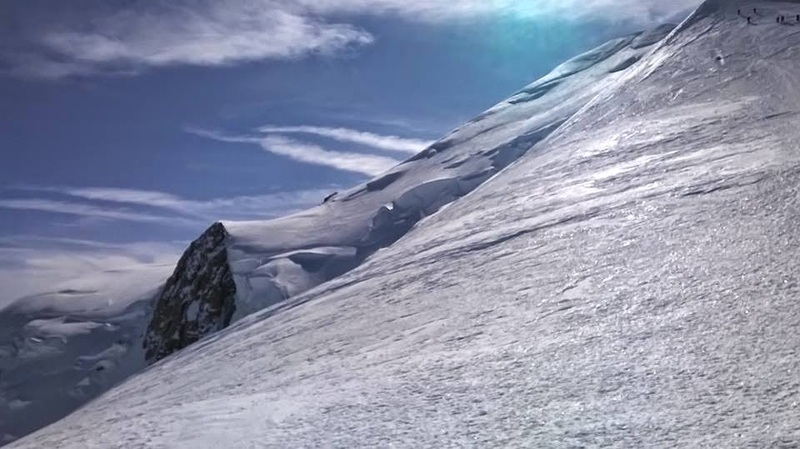 Staying on the Italian side of the ridge allowed some respite from the spin drift and constant wind, yet this small victory was soon to be quashed by the need to rise to the Roches de la tournette and finally the summit. By now, I had completely given up at looking at the view and started to stare vacantly at my feet, counting the many steps to the ever closer summit of Mont Blanc. 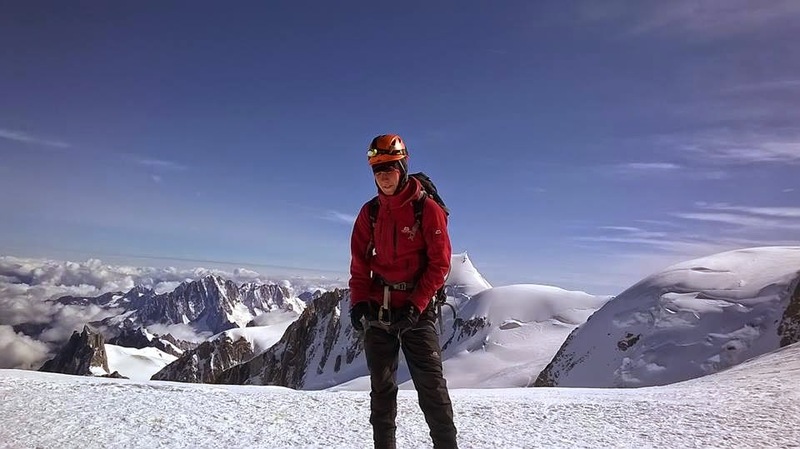 Finally, after leaving the Tete Rousse 7.5 hours earlier we reached the summit at 9:27am on the 24th Of August. The view, spectacular, the conditions, terrible. Spin drift was making eyesight difficult and the altitude was affecting both of us, and after almost two days of climbing we spent nearly 120 seconds savouring the moment before giving each other a high five and quickly descending. Shortly after, and roughly 70m down from the summit, I got the 'screaming barfies' or hot aches, on my nose, from the constant spin drifts, and had to sit down and regain feeling and get over the pain, and push on down. The further down we got the easier everything became, the wind dropped the temperature rose and the altitude once again started to work in our favor. Our next job was to get down to the train before the last one left, or risk having to Bivy at the train station, which neither of us felt like doing, so quickly descending down the grand Coulior, dodging mountain guides and their clients and stopping at the Tete Rousse to pick up our sleeping bags and other heavy items we had left for the summit push, we made it down to the base with over 30 minutes to spare and promptly fell asleep on the platform, surrounded by people who we had seen on the summit that day. L Scrambling and the such for children aged, 7-17. This summer has been full of your cliche moments and stunning views, but it has also been one of significant change. Not only have I learned how to teach children in adventure sports, but have learned social lessons, and of course a whole new range of climbing skills and mind sets. I have been lucky to of worked with Ian Johnson, who is MIA, mountain Rescue and Ex Firefighter. Who has made it his job to increase our climbing skills, and rope work. 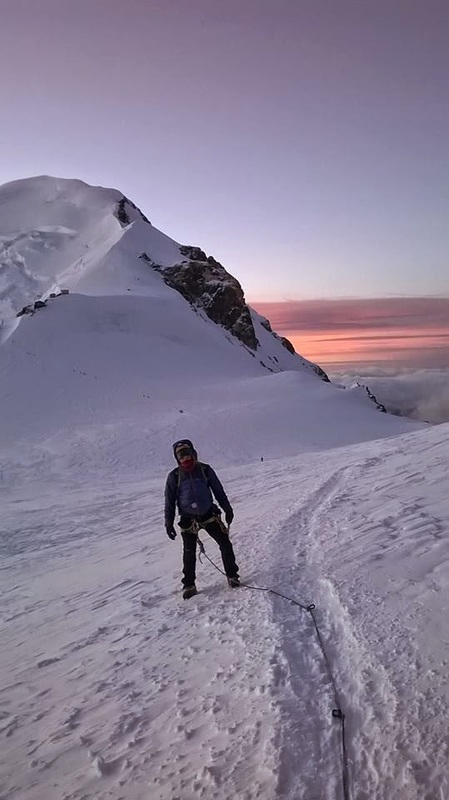 I have been lucky to climb in Servos, Doranaz and the mighty Chamonix. All under the eye of Ian. Since being here, I have discovered the wonder that is pristine sport climbing, with those glinting bolts leading the way up many routes. I have also been taking advantage of the SPA trained fellow team mates, who have us around Switzerland for some amazing days on the crag. Rope work, has been a pinnacle point of change in my climbing, since being here, I have well and truly learnt what is needed for my SPA. Getting one day a week off, does not give enough time to head out on large climbing adventures, and the weather has been past dismal, bordering on Scottish, and the amount of quality days on the rock has been sadly limited, yet I have taken the opportunity to learn some alpine rope work, and techniques. 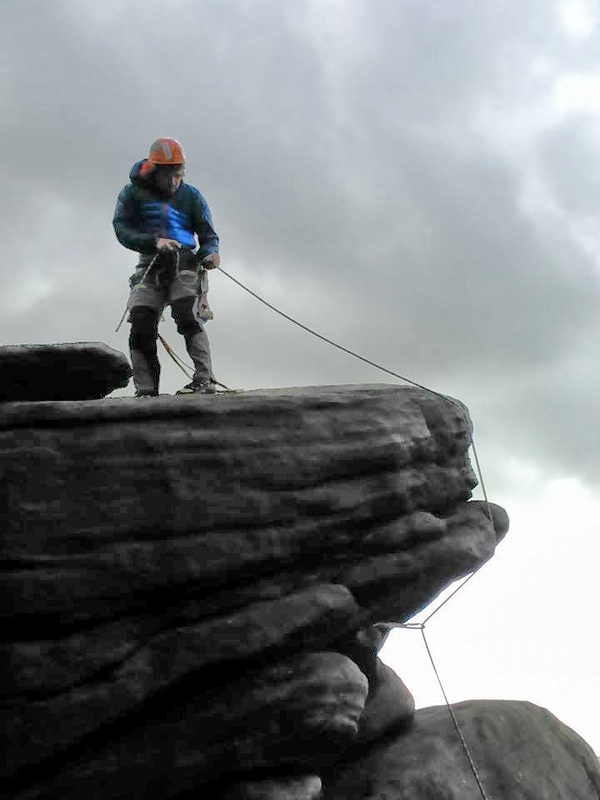 Such as stomp belays, T belays, Cravasse rescues and basic assisted hoists, and problem solving on the crag and hill. 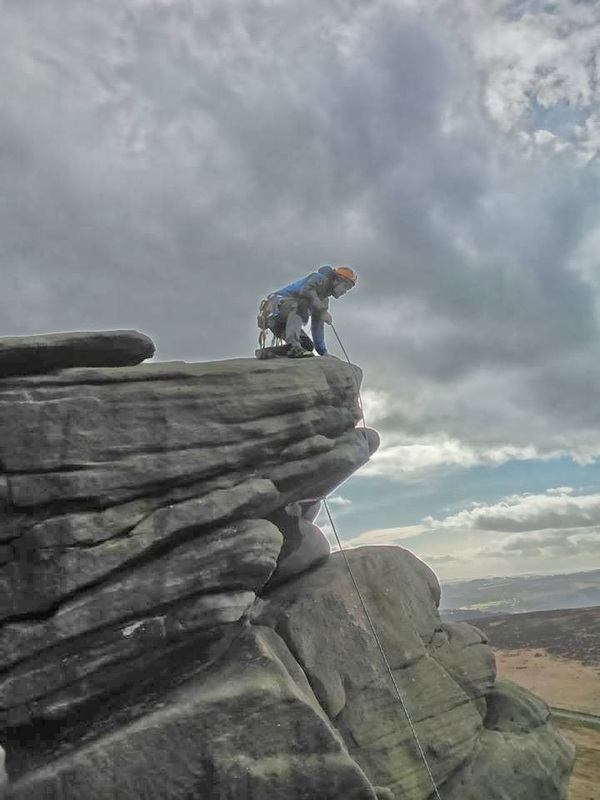 Grade wise, there has not been a significant improvement, but there has been some, with the climbing differing massively to that of U.K trad climbing. I will report more when I return to the U.K, until then here are a few photos from my travels to Chamonix. Been a bit of time between the last blog, I have been living the typical university life, lack of food, lots of drinking and constant life questions every day. I now have a job working in a cafe, which will help my money saving (hopefully) I also have a lot of uni work to do, assignments and the like. But what about the climbing? Well, I have been trying to get as many outdoor days in as possible, with the weather improving and the rock drying out, I have recently been to Lower Scout and Helm Crag, and climbed one the best routes I have climbed to date! The climb was an MVS, it was very exposed climbing yet it wasn’t extremely technical, the run outs were massive, yet only occasionally did I seem out of my depth. 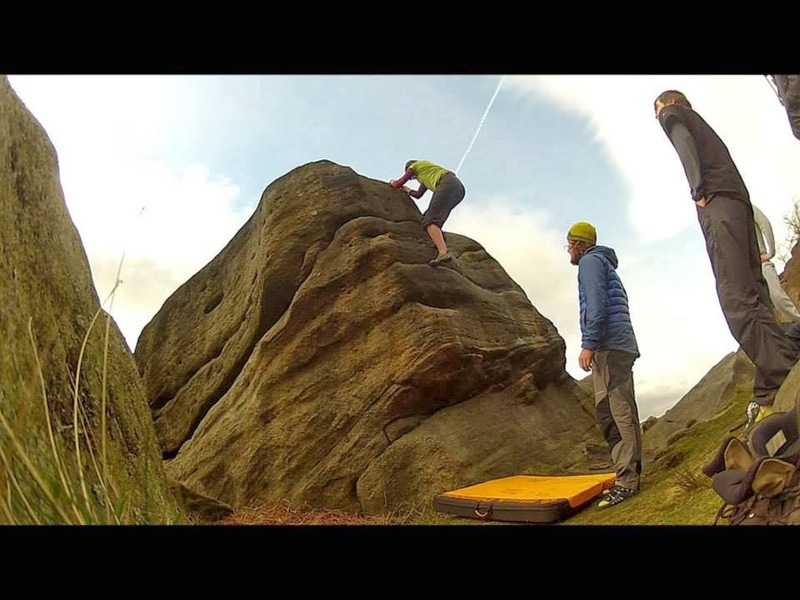 In fact the trip to Helm crag was full of reasons why I love climbing. Just a short bike ride out of Ambleside (4 miles) and we were scrambling to the foot of the crag. The crag has a distinctly blocky look, and some parts simply look like someone has placed block on block. 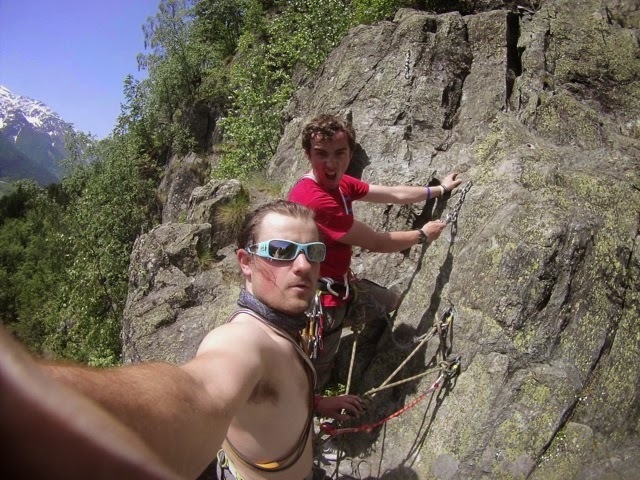 We had just finished uni for the day and it was very warm weather, we had roughly 3-4 hours of sunlight left, and the routes although slightly damp in the cracks, were in perfect condition. Looking back on the day, there was a E1 that I would really like to give a go. 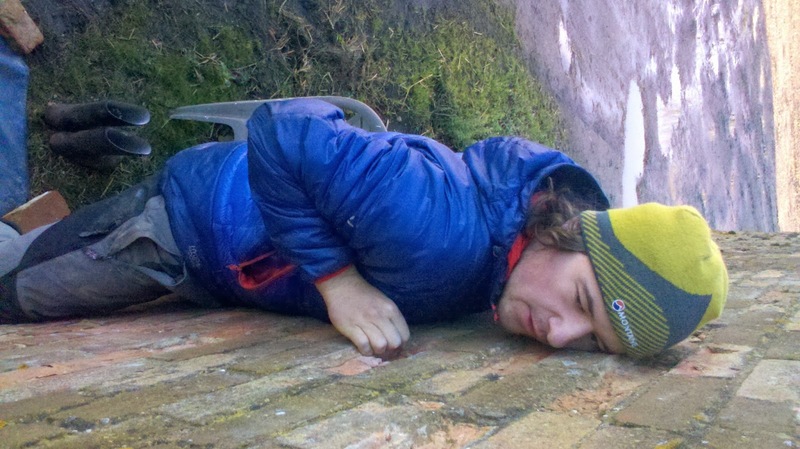 One of my mates Ben Roe, climbed it and described it as easy climbing yet ‘simply dangerous’. Watching him there were very long run outs and in fact only three pieces of gear on the whole route, yet the style of climbing looked well and truly within my reach. Until next time! I will hopefully of done the classic routes on upper scout by the time I reblog! Photos to come! Haven't written for a very..long time and I am not going to lie, I have been lazy. Well lazy pretty much sums up my planning preps at the moment. But I had a sudden boost of motivation today. I am off tomorrow to my Camp Suisse selection day, and if I pass I will have a job over summer, next to some of the most stunning climbs in the world! My main aims for the money saved up from the summer job is to (obviously) see about buying big wall gear and save for the money needed for flights, food etc. I am hopefully undertaking my SPA (Single Pitch Award) training this may and then after that heading to North Wales to complete a two day course in big wall climbing, if I can get the money together of course (got to love being a student). Of course I have a hell of a lot of course work to be getting on with, but if I keep chipping away it should be just fine. 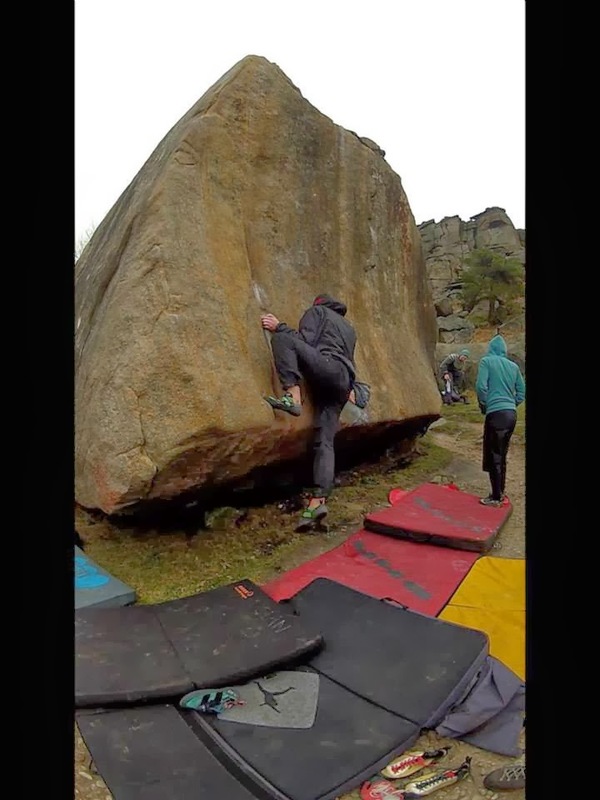 I have been climbing at Stanage Edge (Peak District U.K) and got a few solid classic routes in, Flying Butteress being one of them. I have been trying to go to the wall, both in Ambleside and Kendal, to keep me in shape, with Andy and I trying a strange Multi Pitch route at Kendal wall, more of that to come. Keep you posted more often now, I promise! 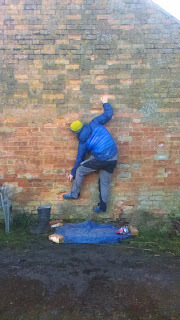 There has recently been a 7b put up at the wall, which I tried at the end of a hard session yesterday, I surprised myself, but yet still have a long way to go, I managed the first two moves and the next is somewhat of a guess at this time but if I had to say, I would think it would be a three finger crimp with little else to gain any kind of hold that my body will allow at the moment, but I plan to go tonight and try again afresh, our training starts on Monday with everything fully in position and planned for the rest of the term. The new Geshidos are perfect! managing pockets that I would only dream of in my last pair! More photos and Training routines to come! Keep blogging! Hello there! Long time no blogging, Will and I are back at university with a hard-core training plan laid out for ourselves, with the intention of climbing 7b+ in 6 months continually, a huge amount of cardio and strength and conditioning is in order! Spain and a few competitions being our motivation to work hard! Had a go on the wall today for the first time since leaving and I did better than I expected myself to do! Dogged my first few routes and finally finished on a high with a 6b under my belt. Was quite a shock to see how far I am going to push myself over the next few months but hopefully with the motivation and the determination we should be able to do it without to many qualms. Also found out that Ambleside wall are hosting a comp on the 24th of Feb which should be a good place to gauge my performance when I am pushing myself, I am a bit nervous about the competition world, I like to be able to really focus on the climb at hand but I know myself and the pressure and excitement of a competition could really put me off, but you never know until you try! Also getting some new climbing boots tomorrow, the Geshido Evolv's which I tried on today and I have never felt better in a pair of rock boots before. Anyway over and out and hope to be in better climbing shape soon!! Keep blogging. Training at home is underway, with the haul bag training program pumping my body, and the Christmas Boulder giving me some grief. 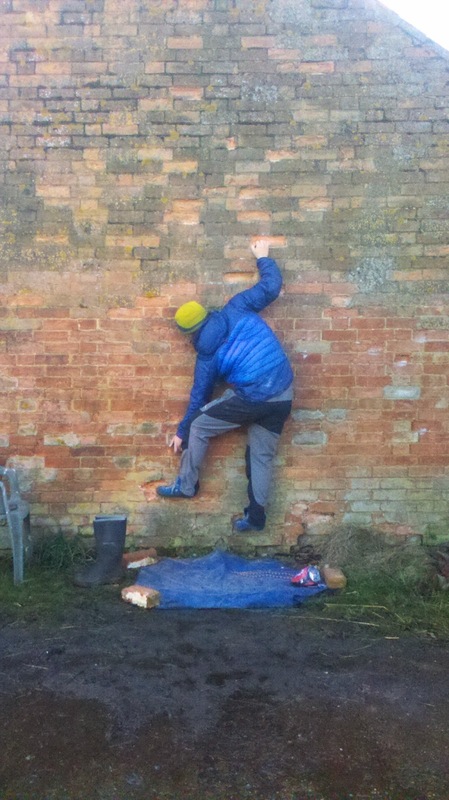 I have managed to figure out the second move on the climb, after trying for hours I managed to get my, fingers to hold in two very tight crimps, I am now at the point where I will need my bouldering mat, only one day to wait for that. I have been looking up some places in Spain for Will and I to travel to (Spain was Wills idea) and Cataluña looks to be the most travelled destination for climbers going to that region, although not a multi pitch infested place, but with 143 sport climbs from 6a to 9b it looks like something we should try out! Will is soon to be joining me on this rock starved Christmas and we are to be writing down are training plan and our goals for 2014. Keep you updated!